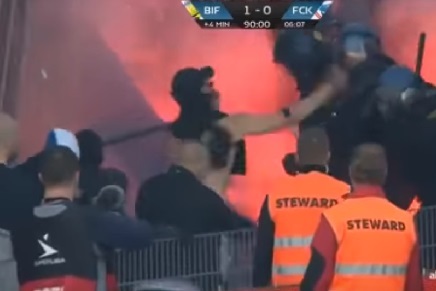 FC Copenhagen has been severely punished for the trouble its fans caused at Brøndby Stadium during the team’s 0-1 loss to their New Firm rivals earlier this month. The football disciplinary authority, Fodboldens Disciplinærinstans, has fined FCK 150,000 kroner and ruled that the team must play without fans for the next home match against FC Midtjylland on September 8 and also for the next home fixture against Brøndby on November 5. “We are talking about behaviour from FC Copenhagen fans that is completely unacceptable and that has endangered people and tarnished the reputation of Danish football,” Fodboldens Disciplinærinstans wrote. Meanwhile, the Lions have appealed against the decision, arguing that the sanctions are far too stringent. FCK also contends that the police should have arrested the troublemakers before the game when they invaded the pitch, instead of letting them back outside the stadium thus allowing them to re-enter with other fans. This time last year, Clara Tauson became the youngest ever Danish tennis champion at the ripe old age of just 13 – besting Caroline Wozniacki’s record of 14. Now, Tauson has qualified for her first Grand Slam for juniors after making the US Open. Despite being just 14, she is ranked 80th in the world on the ITF junior rankings (under-18s). The 16-year-old Danish racing talent, Christian Lundgaard looks a good bet to be Denmark’s next star on the motor track following his triumph in the FIA SMP Formula 4 NEZ championships over the weekend. Lundgaard won the overall standings thanks to two wins in Moscow, which also netted him the tidy sum of 2.25 million kroner. The youngster is part of the Renault Sport Academy setup. Denmark’s left back Jens Stryger Larsen is on the brink of being signed by the Italian Serie A side Udinese. The 26-year-old Austria Vienna player has played over 60 Austrian Bundesliga games since signing from FC Nordsjælland in 2014. Elsewhere, Celtic’s Erik Sviatchenko is strongly rumoured to be signed by FC Copenhagen. A new street football league for youngsters, which includes ten teams from ten different districts, has been launched in Copenhagen. There will be two age groups taking part – under-18 and under-15 – while the ten teams taking part hail from Amager, Nørrebro, Østerbro, Nordvest, Sjælør, Valby, Vesterbro, Vanløse, Bellahøj and Husum. Games are five-a-side and are played outside in the summer and indoors during winter.